Twuffer - Twitter Buffer to schedule tweets for later date! Twitter Buffer to schedule tweets for later date! Those who are familiar with buffer which allows website/bloggers to schedule posts for social media would love this web application. Twuffer is a web tool that allows you to write now, tweet it later. Make a tweet or tweets you would love to show at later date and schedule them on Twuffer. This tool will be useful for digital marketers who wish to be productive and do not want to spend much time on Twitter. Twuffer allows users to have multiple Twitter accounts under one Twuffer account. This means, your team handles can be signed in on Twuffer and use for scheduling tweets. Twuffer comes with a wonderful feature of spreedsheet scheduling. 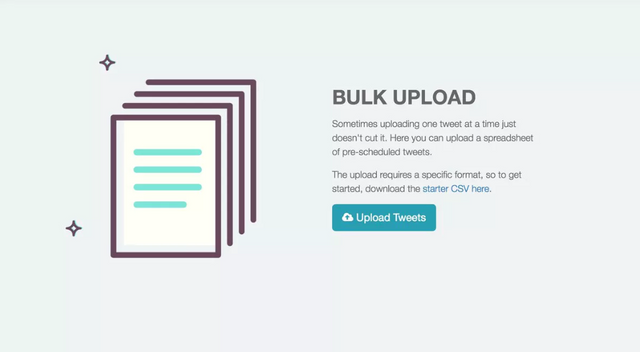 This means you can upload a spreadsheet to schedule your tweets with ease. What a name! Lol, I assume this will be handy for twitter fanatics, I love the idea of scheduling things in advance. I use a similar app for Twitter, but it has some problems. I'm going to explore this, and maybe it's more appropriate for me. Thank you for sharing. What I like about this is the ability to schedule the actual time you want to post. You can get it done, well arranged and post later on. Wogh, I think it's cool, very useful for digital marketing methods, I can set the time for region-based tweets for marketing targets, I like this product, thank you for sharing. WOw this thing is really awesome!!!!!! you can manage lot of your tweets those you want to do later on and this is pretty accurate and nice. Scheduling tweets for a later date? I suppose if one tweets this'll make life much more easy and tolerable for those ideas that come along outa' the blue? I don't tweet but I can see where this would be useful for those that do. WOW this product is really useful for me as i am a digital marketer!